Donna Bain was born in Hythe, AB. Her parents, Mr. & Mrs. Dan Bain, came from Biggar, Saskatchewan in 1929, the year Hythe was incorporated as a Village and the year the Northern Alberta Railway arrived in Hythe. 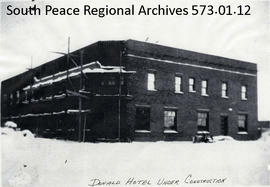 Donna attended the Happy Valley School in Hythe, and in 1950 married Eldon Shail, a grain buyer for the Alberta Pacific Grain Co. They raised two children, Randy and Terri, in the Village of Hythe. Except for 10 months in 1971, when Federal Grain moved Eldon to Fort St. John for a short time, Donna spent her entire life in the Village of Hythe. She volunteered with the United Church as a Sunday School teacher and as a leader in CGIT; was active in the United Church Women, and in the Royal Purple for 28 years; and helped the Hythe Golden Age Club take care of the small Hythe museum and tourist booth. Because of her personal interest in Hythe, Donna collected and compiled scrapbooks about the Village's history which were on display at the Hythe Museum for many years. The records were collected by Donna Shail through her years of living and volunteering in Hythe, Alberta. 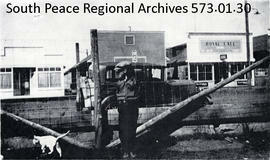 The fonds consists of scrapbooks containing photographs, stories, paper artifacts, and news clippings covering the history of Hythe from the time it was established as a townsite on the NAR railway in 1929 into the 21st Century. There are also albums of the Hythe Homecoming in 1978, the opening of the Hythe Golden Age Craft Centre in 1981, and Celebrate Hythe in 1989; one album of people and buildings in Hythe ca. 1970-2000. There are also two scrapbooks containing 198 memorial cards to tell us about the people who lived in Hythe, and a loose collection of photographs which cover the history of Hythe from 1916-2007. The paper records consist of receipts from various Hythe businesses: Frederick Tite, H.W. Reich, Frontier Lumber Company, W.R. Salmers, A.L. MacRae, Harold S. Tveten, Robert Reid, McLeod & Inkster, Chartier Bros., J.P. Gerlinger, F.F. Perdue, G.B. Howlett, E. Hansen, Oakfords, Peasron Garage, Geo. A. Pollock, Light & Swanston Ltd. And F. Adams and Son. The photographs are described in the order in which they appeared in the scrapbooks. These records were donated to South Peace Regional Archives on 23 July 2013.